Dreaming of a Latina romance? Find the girl of your dreams on the AmoLatina.com website! AmoLatina.com is an international online dating site service that brings you thousands of Latina and Latino singles from all over the world. Meet attractive people from Mexico, Columbia, Brazil and much more. Find companionship today! Most people believe that love from online dating comes by chance, just like how it happens in romantic comedy movies. Actually, there’s only a slight chance that serendipity takes effect. Most of the time, you have to have a smart online dating approach to meet the right people and, eventually, the right person. Through this guide, you’ll be able to learn about the different techniques you can use to date efficiently on AmoLatina.com. We’d all like to think that we might meet the love of our lives online by chance or by fate. The truth is most of the time; we need to take matters into our own hands. Being proactive prevents us from wasting our time and overlooking people who are genuinely interested in us. Signing up to AmoLatina is easy and straightforward. Check out this guide if you want to learn how you can do this. After users sign up for their free account, they usually don’t pay too much attention to their profile because they are anxious to get started. The quickest and least dramatic way to a fulfilling online dating experience is by choosing a trusted service. There are many bogus sites out there, so finding a legitimate site is essential. Fake sites look all pretty and inviting with their colorful layouts and almost too good to be true testimonials. Then there’s the occasional gem that restores your faith in the process. In this case, AmoLatina.com is one of the best examples. The service is designed to make the whole niche dating thing as easy and worthwhile as possible. One great thing about it is that it is available as a mobile phone app, so you have control of your love life literally at the palm of your hand. In addition to convenience, the AmoLatina mobile dating app has some pretty cool features. Below are 3 of the best of these and what you stand to gain from them as a member. Choosing to sign up to online dating means that you accept the challenges of sifting through thousands of profiles to find your prince/princess charming. With so many profiles out there you will need as much help as you can get. That is where the Let’s Mingle feature comes in. On the top right corner, you'll see a button titled 'Sign in with Email." Click on the button and then choose 'Create Your Account' from the bottom of the pop-up box. Then, enter your name or nickname, your email address, and your chosen password. That's it! You're now ready to start browsing profiles of thousands of Latin members. 2. Is AmoLatina.com a marriage agency? 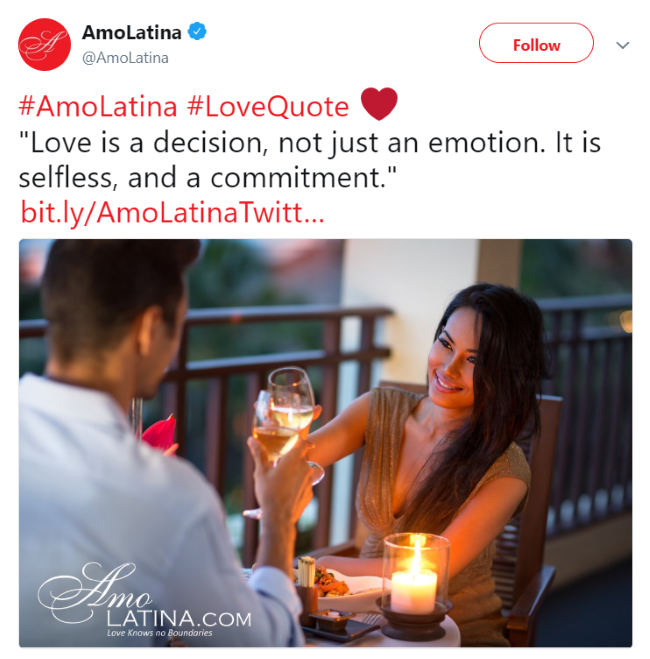 AmoLatina.com is not a marriage agency; it is a communications platform that connects people with Latin American singles. The site is intended for men and women who are interested in international relationships, be it romantic relationships or just international friendships. 3. How much do services on AmoLatina.com cost? Members can purchase 20 credits for $9.99 and get free introductory messages, ten free emails, and ten free chats. You should sign up for a monthly subscription because credit packages for subscribers are substantially cheaper. To buy credits or set up a monthly subscription login to your account, click on 'Upgrade My Account' and fill in the requested details. The payment page offers information about all the different packages. You can also find more information on this page. 4. I have not set up my profile yet, but I am getting lots and lots of messages from gorgeous women. Is AmoLatina a scam? Those interested in Latin dating will sooner or later come across AmoLatina.com. The leading online dating portal has a large member base consisting of members from all Latin countries and from around the world. This detailed review serves as a guide for deciding if this is the right website for you. The international AmoLatina communications platform is open to both genders. With more than a decade of experience in bringing people together, the portal takes aim at expanding online dating opportunities. With that goal in mind, they have focused on creating a safe digital space for singles to meet and enhance their connection. The site's name translates to "love Latina," and the portal is geared towards finding Latin matches. For example, you can use the site to connect with Brazilian, Argentinian or Colombian members. AmoLatina has built various communication systems for members to stay connected and make advances in their relationships. The features include a Live Chat, thousands of profiles, Video Chat, a mailing system, virtual gifts, and more. Knowing that safety is the key to online dating, AmoLatina has taken steps to ensure that members enjoy a secure dating experience. Privacy policies, as well as strict Anti-Scam policies, have been put in place to keep personal information safe. If you want to start with online dating, all it takes to sign up to the portal is using your regular email address, your Facebook account or Gmail account. When choosing the first option, go to the site and click "Sign in with email." You will be asked to enter some basic info. Select a nickname, add your email and come up with a password. For the other option, go to the site and click on the "Sign in" button underneath "Take a Chance." You will be asked for permission to allow AmoLatina to gather info from those accounts. The majority of the services are focused on enhancing communication. As a premium communications platform, AmoLatina covers all the bases. Members can enjoy features such as Live Chat, introduction videos, Video Chat, sending presents and more. Membership comes in two forms: basic membership and an upgraded membership. Signing up for the first one is free. However, a lot of the services are limited unless you upgrade. Upgrading to a premium membership has been made accessible for all with the lowest rate being $9.99. The package guarantees you twenty credits, ten free chats, ten free emails, and free introductory messages. Once credits are used up, they can be purchased via a credit card or using PayPal, whatever you find more convenient. All new users must comply with the verification process. If they do not, their application will be rejected. There is also a security team that reacts to reports of any suspicious activity. All members can also notify the team when an incident occurs. Something that often happens in online dating is someone misrepresenting themselves via using photos of another person. To tackle this issue the security team conducts video calls or personal interviews where necessary. Should a person fail this process, they will not be able to join the portal. If a member is concerned that they have been scammed, they can report it to the security team. If the team concludes a scam has indeed taken place, the party that lost money will be reimbursed, and the scammer will be banned from the site. AmoLatina is focused on providing members a fun, convenient and safe way of online dating. You can enjoy a multitude of features via the site or by downloading the AmoLatina mobile app from the Google Play Store or the iTunes store. Finding love online can be very tricky whether it is your first time or you are a seasoned internet dater. The good news is that there are many easy tips and tricks out there that should help make your life a whole lot easier. It all depends on the dating website that you are using. With AmoLatina, the important thing is to have a great profile and to know what to look for in other profiles. Below are a few tips that should help you in each step allowing you to truly make the most out of your experience. Finding a perfect match means finding a single person who is as interested in you as you are in them. This means that your profile needs to be nothing short of amazing. That way mutual attraction is a guarantee. So, what makes a perfect profile? What will draw a suitor to you? Here are four answers and tips to help you make your profile a winner. Lying is no way to start a long-lasting relationship. Therefore, your profile needs to be as honest and accurate as you can make it. There is no need to lie about your name or age. This only complicates matters down the line when you end up finding someone worth the investment of time and emotions. AmoLatina is without a doubt one of the best online communication platforms out there. If you have already signed up, then you know exactly what we are talking about. If you haven’t, then get to it right away and start connecting with exotic singles. In addition to AmoLatina’s popular mobile app and the website, they also have a strong social media presence. These platforms are used to connect better with singles like you. Below are seven reasons why you should follow AmoLatina on social media. AmoLatina, the premium online dating service, offers all the vital tools one needs for a wonderful online dating experience. Thousands of profiles rich with detailed information alongside various chatting, e-mailing and video features – all are readily available. This classic feature allows sending and receiving of messages in real time. If you find someone you want to connect with, you can begin by clicking the “Chat Now“ button on their profile. Those with an upgraded membership get ten free chats for three minutes. Once all the free credits are used up, the chat service costs one credit per minute. Let’s Mingle is a messaging system invented to accommodate those who prefer sending a message to a group of potential matches at once. To begin using the feature, select specific traits you are interested in: profession, a certain age or even hair color of your ideal mate. Next, create a short personalized message. Once you’ve set it up, all potential matches that fit your selected criteria will receive it. This messaging feature requires upgrading from free membership to a premium membership. Those who upgrade can use Let´s Mingle free of charge once every 24-hours. One-Way Video is a simple feature. It allows one person to see the other’s video while chatting. To begin a video chat, go to a member’s profile and click on “Share My Video.“ One minute costs four credits. scrambling to give a boost to their security methods. The first thing every online dater should pay attention to is if their chosen site has an anti-scam policy. It sets the tone for the entire time you use the services. AmoLatina has put together a strict anti-fraud system, outlining tips on how to stay safe as well as stating which measures to take to detect scammers, where to turn if a member suspects a scam has taken place, or how reimbursement of credits will be worked out. Quick note: members who have fallen victim to a scam can request reimbursement. AmoLatina has put together a special team that works around the clock and focuses on dealing with any and all security matters. These are the folks to be contacted when suspicious activity is detected by someone on their staff or by a member. The team looks after the safety of personal details you have shared with the site and makes sure this data stays safe. They also ban people who behave incorrectly - no suspicious activity or harassment is tolerated. Background checks are a must in modern day online dating, and on AmoLatina, they are regularly conducted for new members signing up. Anyone that does not pass a background check does not get to be a part of the site. Those that do are free to use the services. Any online dating site that wants to be taken seriously and have any success needs to prioritize their member base. So, by far the best indicator of a good site is whether or not they do their utmost to protect their members. AmoLatina.com clearly does. When it comes to online dating, you want to have a hassle-free experience. In order to get it, you need access to a high-quality dating site with a large member base and the best online communication tools available. AmoLatina.com is one such site that has put a lot of effort into building a handy communications system for their members. No modern day online dating site can get by without a live chat platform. On AmoLatina, the Live Chat feature is readily available to all premium members and other than chatting allows members also to send photos and videos. Live Chat is the most used feature to communicate with potential matches. It also exists in the AmoLatina mobile dating app, which helps make communicating much more effortless. The Offline Chat feature is an expansion of the Live Chat service. It allows you to send chat messages to potential matches even when they are offline. As soon as they log back on, they get your message and can respond to you in real time. Just like Live Chat, an email system is another must in online dating. It is pretty straightforward and works just like any other email platform. If you find a member you want to send an email to, simply visit their site and click on ’’Send Email’’. Let’s Mingle is a useful tool for those who do not have a lot of time on their hands and do not want to browse through a ton of profiles. Let’s Mingle allows you to set filters such as age, nationality, profession, etc. and send a message to all the people who fall into this group. The feature is a part of a monthly membership that is free for use once a day. One of the tools that makes online dating feel much more meaningful is “Gift Delivery.” If you find someone you are interested in, you have the option of sending them a real gift. Choose between flowers, chocolates or what have you and AmoLatina will send them to your potential match!